MainBlogsWhat is Democracy? Define It. What is Democracy? Define It. I'm writing this in "theory," not crossing t's and dotting i's and saying how it is or isn't applied today. I hope that you readers will be able to get the meaning by yourselves and respond intelligently in the comments. In the Senior Citizen Adult Education program I attend in the Ofra Girls High School, we have a class on social issues in cinema. 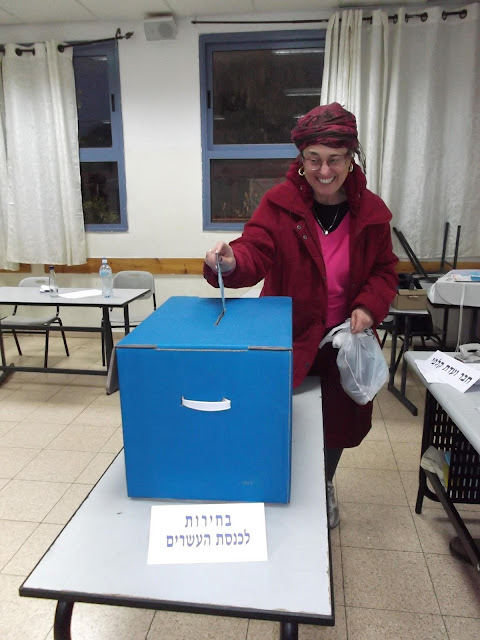 One week they showed us a classic Israeli movie, Sallah Shabati, which has a scene in which the new immigrants in the brand new State of Israel is being introduced to democratic elections. They don't understand the meaning of democracy. The immigrants depicted are from countries that either never had democratic elections or hadn't for awhile, this being just after World War Two. Somehow they come to the mistaken conclusion that democracy means that everyone can do what they want. Of course I was seething. That's anarchy, not democracy. Obviously they thought that by voting each one can demand what they want. Democracy means that the majority, after a vote, wins. And the minority loses. There is only one winner. In some cases, that may really be a plurality, not a majority. To simplify the difference between the two terms think in percentages. For a majority, you need over fifty percent, 50%. 50.1% versus 49.9% means that the candidate or referendum, or whatever that got that 50.1% is the only winner. The one who got 49.9% is "history." There are government systems that have a position called "Leader of the Opposition" for the loser who got the most votes, but most countries send the loser off to pasture and history postscripts. A plurality means "the most" in comparison to others. So, if there had been four choices and the results were 26%, 38%, 11% and 25%, the one with 38% would be the winner. Some government systems have a runoff election if nobody gets a majority or more than a certain percentage, like 40%. Then just the two candidates who got the highest amount face each other in elections. In a law-abiding democracy, the citizens, whether happy or not, accept the result of elections. That is the basic democratic principle I was raised with and educated in. Only in unstable, antidemocratic fascist societies do citizens protest the results of elections.